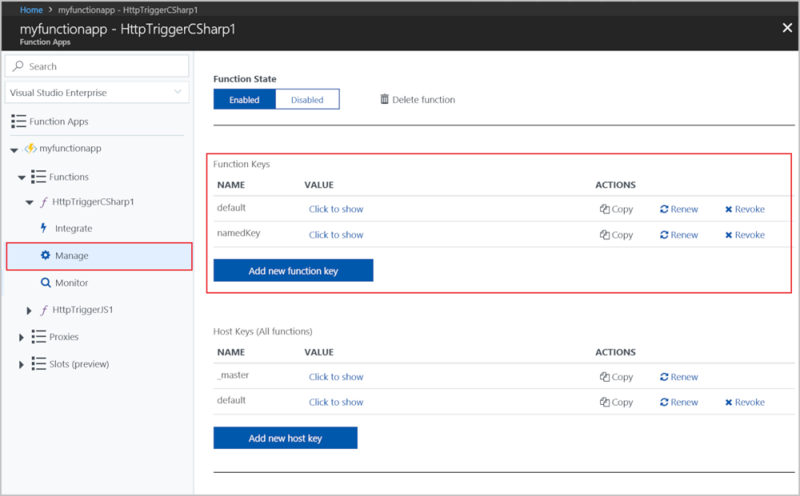 This article explains how to work with HTTP triggers and output bindings in Azure Functions. An HTTP trigger can be customized to respond to webhooks. If you plan to use the HTTP or WebHook bindings, plan to avoid port exhaustion that can be caused by improper instantiation of HttpClient. For more information, see How to manage connections in Azure Functions. The code in this article defaults to Functions 2.x syntax which uses .NET Core. For information on the 1.x syntax, see the 1.x functions templates. The HTTP bindings are provided in the Microsoft.Azure.WebJobs.Extensions.Http NuGet package, version 1.x. Source code for the package is in the azure-webjobs-sdk-extensions GitHub repository. Support for this binding is automatically provided in all development environments. You don't have to manually install the package or register the extension. The HTTP bindings are provided in the Microsoft.Azure.WebJobs.Extensions.Http NuGet package, version 3.x. Source code for the package is in the azure-webjobs-sdk-extensions GitHub repository. The HTTP trigger lets you invoke a function with an HTTP request. You can use an HTTP trigger to build serverless APIs and respond to webhooks. By default, an HTTP trigger returns HTTP 200 OK with an empty body in Functions 1.x, or HTTP 204 No Content with an empty body in Functions 2.x. To modify the response, configure an HTTP output binding. The following example shows a C# function that looks for a name parameter either in the query string or the body of the HTTP request. Notice that the return value is used for the output binding, but a return value attribute isn't required. The following example shows a trigger binding in a function.json file and a C# script function that uses the binding. The function looks for a name parameter either in the query string or the body of the HTTP request. The configuration section explains these properties. You can bind to a custom object instead of HttpRequest. This object is created from the body of the request and parsed as JSON. Similarly, a type can be passed to the HTTP response output binding and returned as the response body, along with a 200 status code. The following example shows a trigger binding in a function.json file and an F# function that uses the binding. The function looks for a name parameter either in the query string or the body of the HTTP request. The following example shows a trigger binding in a function.json file and a Python function that uses the binding. The function looks for a name parameter either in the query string or the body of the HTTP request. The following examples show the HTTP trigger binding in a function.json file and the respective Java functions that use the binding. This example reads a parameter, named id, from the query string, and uses it to build a JSON document returned to the client, with content type application/json. This example reads the body of a POST request, as a String, and uses it to build a JSON document returned to the client, with content type application/json. This example reads the body of a POST request. The request body gets automatically de-serialized into a ToDoItem object, and is returned to the client, with content type application/json. The ToDoItem parameter is serialized by the Functions runtime as it is assigned to the body property of the HttpMessageResponse.Builder class. In C# class libraries, use the HttpTrigger attribute. For a complete example, see Trigger - C# example. The following table explains the binding configuration properties that you set in the function.json file and the HttpTrigger attribute. type n/a Required - must be set to httpTrigger. direction n/a Required - must be set to in. name n/a Required - the variable name used in function code for the request or request body. anonymous—No API key is required. function—A function-specific API key is required. This is the default value if none is provided. admin—The master key is required. For more information, see the section about authorization keys. methods Methods An array of the HTTP methods to which the function responds. If not specified, the function responds to all HTTP methods. See customize the http endpoint. route Route Defines the route template, controlling to which request URLs your function responds. The default value if none is provided is <functionname>. For more information, see customize the http endpoint. webHookType WebHookType Supported only for the version 1.x runtime. genericJson—A general-purpose webhook endpoint without logic for a specific provider. 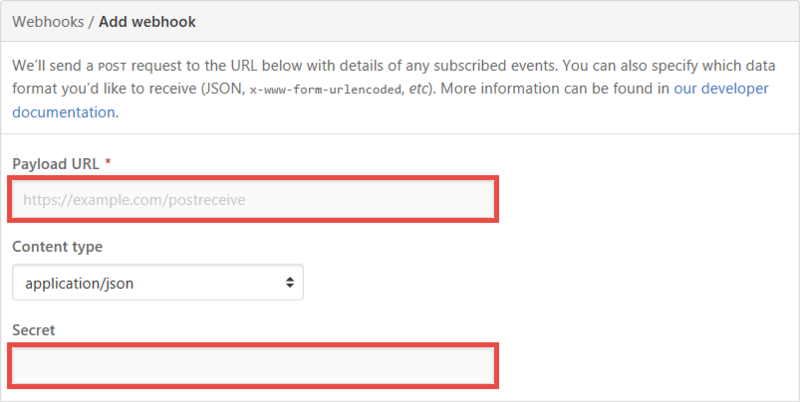 This setting restricts requests to only those using HTTP POST and with the application/json content type. github—The function responds to GitHub webhooks. Do not use the authLevel property with GitHub webhooks. For more information, see the GitHub webhooks section later in this article. slack—The function responds to Slack webhooks. Do not use the authLevel property with Slack webhooks. For more information, see the Slack webhooks section later in this article. For C# and F# functions, you can declare the type of your trigger input to be either HttpRequest or a custom type. If you choose HttpRequest, you get full access to the request object. For a custom type, the runtime tries to parse the JSON request body to set the object properties. Using this configuration, the function is now addressable with the following route instead of the original route. This allows the function code to support two parameters in the address, category and id. You can use any Web API Route Constraint with your parameters. The following C# function code makes use of both parameters. Here is Node.js function code that uses the same route parameters. body: "All " + category + " items were requested." body: category + " item with id = " + id + " was requested." By default, all function routes are prefixed with api. You can also customize or remove the prefix using the http.routePrefix property in your host.json file. The following example removes the api route prefix by using an empty string for the prefix in the host.json file. If your function app is using App Service Authentication / Authorization, you can view information about authenticated clients from your code. This information is available as request headers injected by the platform. You can also read this information from binding data. This capability is only available to the Functions 2.x runtime. It is also currently only available for .NET languages. Functions lets you use keys to make it harder to access your HTTP function endpoints during development. A standard HTTP trigger may require such an API key be present in the request. While keys may help obfuscate your HTTP endpoints during development, they are not intended as a way to secure an HTTP trigger in production. To learn more, see Secure an HTTP endpoint in production. In the Functions 1.x runtime, webhook providers may use keys to authorize requests in a variety of ways, depending on what the provider supports. This is covered in Webhooks and keys. The version 2.x runtime does not include built-in support for webhook providers. Host keys: These keys are shared by all functions within the function app. When used as an API key, these allow access to any function within the function app. Function keys: These keys apply only to the specific functions under which they are defined. When used as an API key, these only allow access to that function. Each key is named for reference, and there is a default key (named "default") at the function and host level. Function keys take precedence over host keys. When two keys are defined with the same name, the function key is always used. Each function app also has a special master key. This key is a host key named _master, which provides administrative access to the runtime APIs. This key cannot be revoked. When you set an authorization level of admin, requests must use the master key; any other key results in authorization failure. Due to the elevated permissions in your function app granted by the master key, you should not share this key with third parties or distribute it in native client applications. Use caution when choosing the admin authorization level. Keys are stored as part of your function app in Azure and are encrypted at rest. To view your keys, create new ones, or roll keys to new values, navigate to one of your HTTP-triggered functions in the Azure portal and select Manage. There is no supported API for programmatically obtaining function keys. The key can be included in a query string variable named code, as above. It can also be included in an x-functions-key HTTP header. The value of the key can be any function key defined for the function, or any host key. You can allow anonymous requests, which do not require keys. You can also require that the master key be used. You change the default authorization level by using the authLevel property in the binding JSON. For more information, see Trigger - configuration. When running functions locally, authorization is disabled regardless of the specified authentication level setting. After publishing to Azure, the authLevel setting in your trigger is enforced. Turn on App Service Authentication / Authorization for your function app. The App Service platform lets use Azure Active Directory (AAD) and several third-party identity providers to authenticate clients. You can use this to implement custom authorization rules for your functions, and you can work with user information from your function code. To learn more, see Authentication and authorization in Azure App Service and Working with client identities. Use Azure API Management (APIM) to authenticate requests. APIM provides a variety of API security options for incoming requests. To learn more, see API Management authentication policies. With APIM in place, you can configure your function app to accept requests only from the IP address of your APIM instance. To learn more, see IP address restrictions. Deploy your function app to an Azure App Service Environment (ASE). ASE provides a dedicated hosting environment in which to run your functions. ASE lets you configure a single front-end gateway that you can use to authenticate all incoming requests. For more information, see Configuring a Web Application Firewall (WAF) for App Service Environment. When using one of these function app-level security methods, you should set the HTTP-triggered function authentication level to anonymous. Webhook mode is only available for version 1.x of the Functions runtime. This change was made to improve the performance of HTTP triggers in version 2.x. In version 1.x, webhook templates provide additional validation for webhook payloads. In version 2.x, the base HTTP trigger still works and is the recommended approach for webhooks. To respond to GitHub webhooks, first create your function with an HTTP Trigger, and set the webHookType property to github. Then copy its URL and API key into the Add webhook page of your GitHub repository. The Slack webhook generates a token for you instead of letting you specify it, so you must configure a function-specific key with the token from Slack. See Authorization keys. Query string: The provider passes the key name in the clientid query string parameter, such as https://<APP_NAME>.azurewebsites.net/api/<FUNCTION_NAME>?clientid=<KEY_NAME>. Request header: The provider passes the key name in the x-functions-clientid header. The HTTP request length is limited to 100 MB (104,857,600 bytes), and the URL length is limited to 4 KB (4,096 bytes). These limits are specified by the httpRuntime element of the runtime's Web.config file. If a function that uses the HTTP trigger doesn't complete within about 2.5 minutes, the gateway will time out and return an HTTP 502 error. The function will continue running but will be unable to return an HTTP response. For long-running functions, we recommend that you follow async patterns and return a location where you can ping the status of the request. For information about how long a function can run, see Scale and hosting - Consumption plan. The host.json file contains settings that control HTTP trigger behavior. routePrefix api The route prefix that applies to all routes. Use an empty string to remove the default prefix. maxOutstandingRequests 200* The maximum number of outstanding requests that are held at any given time. This limit includes requests that are queued but have not started executing, as well as any in progress executions. Any incoming requests over this limit are rejected with a 429 "Too Busy" response. That allows callers to employ time-based retry strategies, and also helps you to control maximum request latencies. This only controls queuing that occurs within the script host execution path. Other queues such as the ASP.NET request queue will still be in effect and unaffected by this setting. *The default for version 1.x is unbounded. The default for version 2.x in a consumption plan is 200. The default for version 2.x in a dedicated plan is unbounded. maxConcurrentRequests 100* The maximum number of http functions that will be executed in parallel. This allows you to control concurrency, which can help manage resource utilization. For example, you might have an http function that uses a lot of system resources (memory/cpu/sockets) such that it causes issues when concurrency is too high. Or you might have a function that makes outbound requests to a third party service, and those calls need to be rate limited. In these cases, applying a throttle here can help. *The default for version 1.x is unbounded. The default for version 2.x in a consumption plan is 100. The default for version 2.x in a dedicated plan is unbounded. dynamicThrottlesEnabled true* When enabled, this setting causes the request processing pipeline to periodically check system performance counters like connections/threads/processes/memory/cpu/etc. and if any of those counters are over a built-in high threshold (80%), requests will be rejected with a 429 "Too Busy" response until the counter(s) return to normal levels. *The default for version 1.x is false. The default for version 2.x in a consumption plan is true. The default for version 2.x in a dedicated plan is false. Use the HTTP output binding to respond to the HTTP request sender. This binding requires an HTTP trigger and allows you to customize the response associated with the trigger's request. If an HTTP output binding is not provided, an HTTP trigger returns HTTP 200 OK with an empty body in Functions 1.x, or HTTP 204 No Content with an empty body in Functions 2.x. The following table explains the binding configuration properties that you set in the function.json file. For C# class libraries, there are no attribute properties that correspond to these function.json properties. type Must be set to http. direction Must be set to out. name The variable name used in function code for the response, or $return to use the return value. To send an HTTP response, use the language-standard response patterns. In C# or C# script, make the function return type IActionResult or Task<IActionResult>. In C#, a return value attribute isn't required. For example responses, see the trigger example.